Hearts striker John Sutton believes the Scottish Premier League should follow the example of Australia and introduce end-of-season title play-offs. 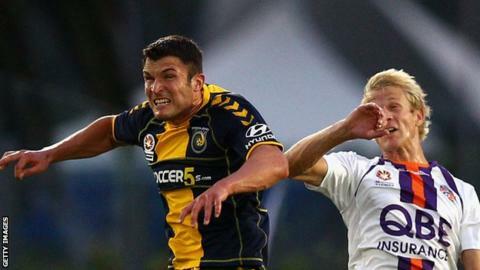 Sutton became a fan of the format despite being a victim of the system while with Central Coast Mariners. "You only have to look at when Celtic visit Tynecastle, the place is absolutely rammed," said Sutton. "If you can imagine that for a game to get to Hampden for a Grand Final, it would be an even bigger match." Mariners finished top of the table but lost out to Brisbane Roar during the play-offs during Sutton's loan spell in Australia from Hearts last season. "It was a bit unfortunate for myself because we won the league," said Sutton. "You get a bit of credit for that and a trophy, but everyone soon forgets about that and you go into play-offs. "It might not be the fairest way in the world - that the top team over the season doesn't win - but it certainly creates a lot of excitement. "With regards Scottish football, Celtic and Rangers have these massive fan bases and it's hard for clubs to compete financially. "But, on our day, I think we can do." Hearts manager John McGlynn this week claimed that the SPL was more exciting without Rangers, now playing in Division Three, and could thrive even more without Celtic. However, Sutton feels play-offs would create fresh interest while retaining the attraction of the Glasgow sides. "The manager made a good point in saying it's probably a bit more competitive and tighter," he said. "But, going back a few years, there was an idea coming from this club about the play-offs at the end of the season. "That could serve both camps. You have your league champions, but for other teams, like Hearts and Motherwell, you can still walk away having won the main tournament at the end of the year."